It’s only natural for the elderly to want to live in their own homes for as long as possible. The comfort and peace-of-mind that come with familiar surroundings helps seniors reduce stress and live happier, healthier lives. Unfortunately, infirmity can increase with age and the risk of injury can grow in and around the homes of seniors. Falls are a top cause of injuries to older adults. Seniors also are at a greater risk than others of dying in a house fire. Many of these and other injuries result from hazards that are easy to overlook, but also easy to fix. 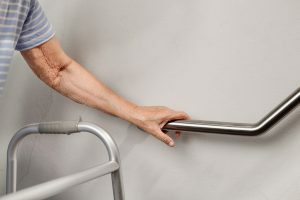 By spotting these hazards and taking simple steps to correct them, seniors and the people who care for them can prevent injuries and help the elderly successfully stay longer in their own homes. Adequate lighting As people age, eyesight can begin to fail, so it’s important to ensure that interior and exterior lighting is improved to reduce the risk of injury due to unseen obstacles. Working smoke and carbon monoxide detectors The need for working detectors cannot be overestimated. Carbon monoxide (CO) is the silent, odorless killer that can spread throughout a home from a faulty furnace and can only be detected with a CO detector. All fuel-burning appliances should be checked regularly for proper functioning and to prevent toxic emissions. Hand railings Good balance and sure footing can be compromised as we grow older. Properly mounted railings should be installed wherever there are steps to prevent stumbling and falls. Slip-resistant surfaces Any flooring where seniors must stand or walk should be free of anything that could cause them to slip and fall. Any area rugs should be secured with double-sided tape or tacks (or, better yet, removed altogether). All showers and bathtubs should have nonslip bathmats (and railings, to assist with entry and egress). Ground fault circuit interrupters GFCIs should be installed in potentially damp locations such as the kitchen, bathroom, garage, near utility tubs or sinks, and on the exterior of the house to protect against electrocution. Appropriate storage High or hard-to-reach areas are no place to keep items that seniors need to access regularly. Medicines and household supplies should be kept in easy-to-access cabinets, shelves, and closets to avoid over-reaching and the use of unstable stepstools or ladders that can lead to falls and injury. Fire extinguishers Small household fire extinguishers are inexpensive and easy to use. Look for ones that carry an ABC rating – that indicates they are designed to put out common household fires such as wood, paper, cloth, grease, paints, and electrical wiring and equipment. Telephone An argument can be made for seniors keeping a landline telephone – the sound quality is generally better; a land line is tied to a physical address for faster, more accurate emergency responses; and newer cordless landline phones provide many of the mobility benefits of a cell phone without the cost of a mobile plan. However, a cell phone (smart or otherwise) is a go-anywhere communications companion that can provide added security and convenience while traveling. Regardless of what kind of phone that makes the most sense for you or the person you’re caring for, having some kind of working phone is vital. For many elderly, the ability to continue living in their own homes offer many benefits, provided they can do so safely. This safety checklist can go a long way in helping you or the one for whom you are providing care live happily at home. This entry was posted in Caregivers, Tips and tagged caregivers, elderly, seniors, tips. Bookmark the permalink. Comments are closed, but you can leave a trackback: Trackback URL.